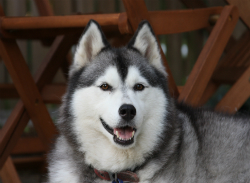 Shop for weight loss supplements for pets at VetDepot.com. 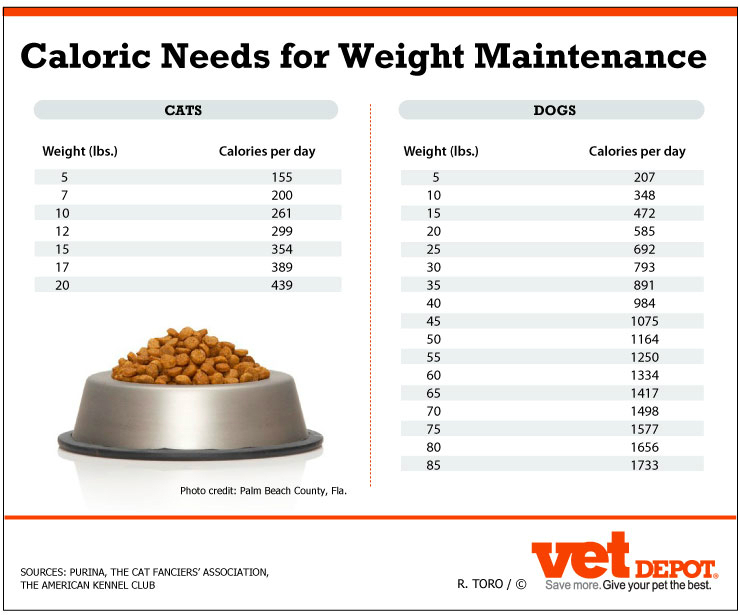 One of the most important ways that owners can keep dogs and cats healthy is to help them maintain a healthy weight. Two factors are essential to doing so: knowing how much pets should weigh and how many calories it takes to keep them at that weight. 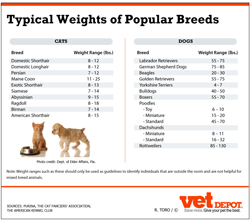 How Much Should Pets Weigh? Weight ranges such as these should only be used as guidelines to identify individuals that are far outside what is considered normal. 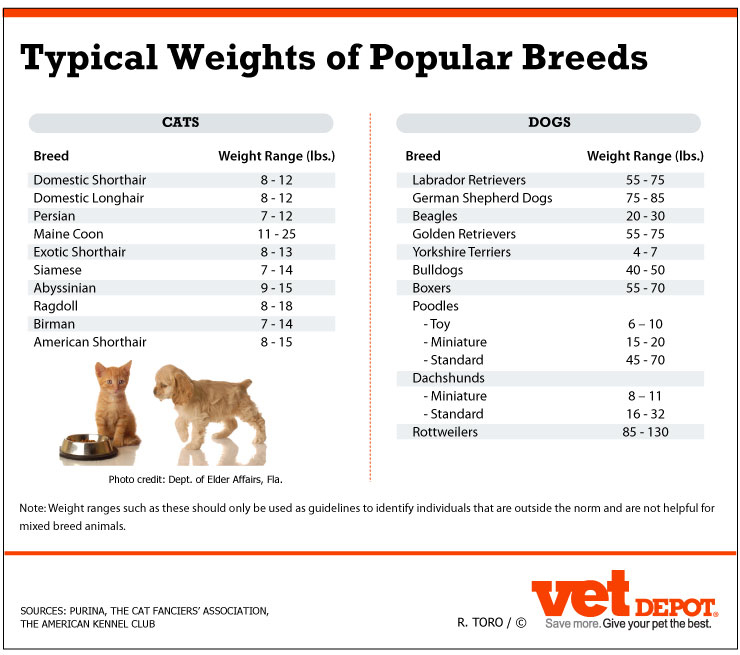 They are not helpful for mixed breed animals, for those that may be especially small or large in stature, or to find the exact, ideal weight for a particular individual. 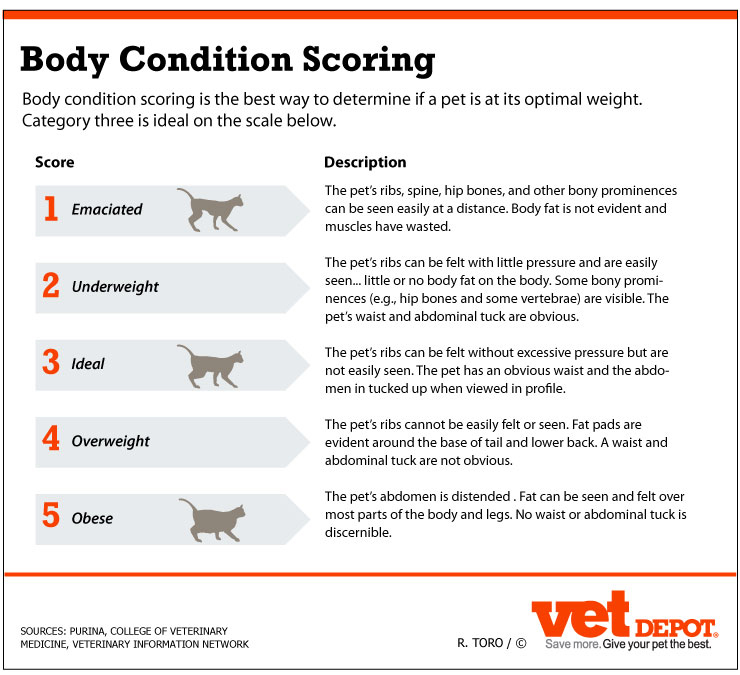 Body condition scoring is the best way to determine if an individual pet is at its perfect weight. On the scale of one to five described below, category three is ideal. 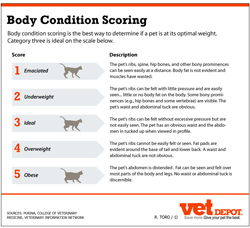 Any questions regarding an individual’s ideal weight and whether or not the animal is in good body condition should be answered by the pet’s veterinarian. How Much Should a Pet Eat? Once an owner knows exactly how much a pet should weigh, determining how much it should eat is relatively simple. 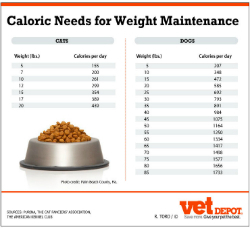 The table below specifies how many calories a typical, adult, neutered dog or cat should take in on a daily basis. Because the needs of individuals can differ markedly, it is not unusual to have to adjust a pet’s intake as much as 20% in either direction to maintain a healthy weight. Pets that need to lose weight should, in general, eat approximately 20% less than what is mentioned above, and pets that need to gain weight should eat 20% more. The caloric density of pet foods and treats are often printed on the product’s label. If not, go to the manufacturer’s website or call them to get this information. The calories contained in many human foods that are used in the making of home prepared diets or given as treats can be determined using the USDA SuperTracker website. To ensure that all of a pet’s nutritional needs are met, limit treats and table scraps to 10-15% of a pet’s total caloric intake. Even low calorie pet treats should be given sparingly. Monthly weigh-ins and body condition scoring are the best ways to ensure that a pet maintains a healthy body weight or is on track for achieving its weight management goals. Energy Requirement Calculator v.3.50. Veterinary Information Network. Accessed 12/6/2012. Body Condition Scoring Chart. College of Veterinary Medicine, Hospital for Companion Animals, The Ohio State University. Accessed 12/6/2012.